The Cunning Little Vixen – British Youth Opera at the Peacock Theatre. 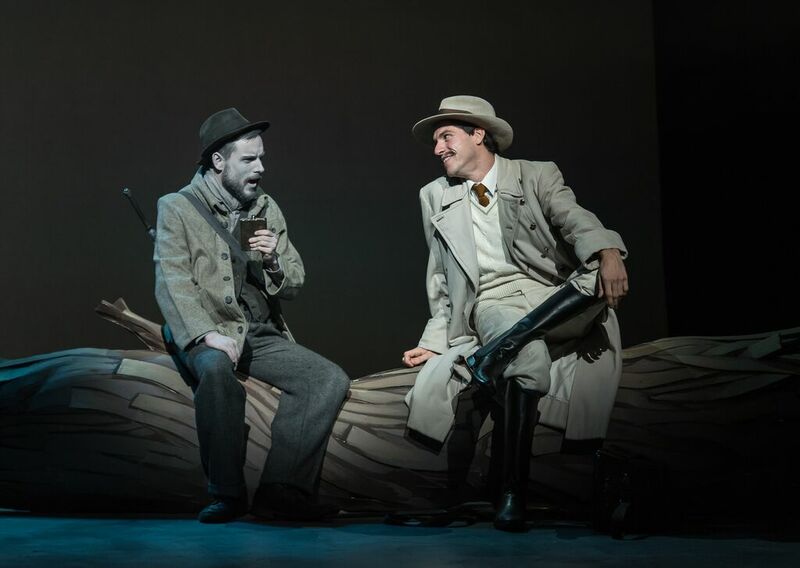 Having warned us last year that the financial situation was such that they might not be able to present their summer opera this year, it is satisfying to be able to report that British Youth Opera (BYO) is back at the Peacock Theatre (from 5 to 12 September 2015) with three operas. A double bill of RVW's Riders to the Sea and Holst's Savitri which premiered on 9 September, and Janacek's The Cunning Little Vixen which premiered last night, 5 September 2015. 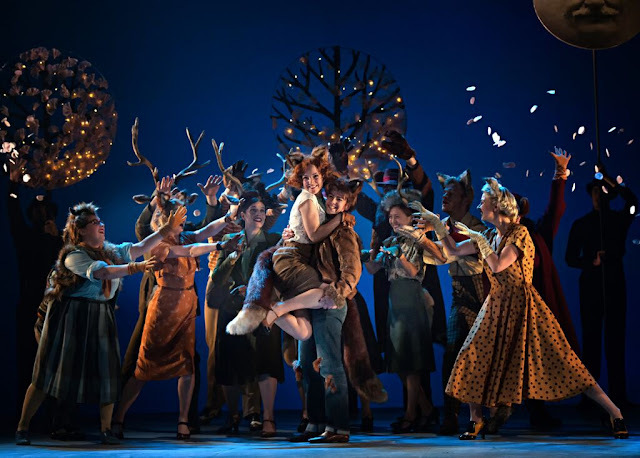 Conducted by Lionel Friend and directed by Stuart Barker, The Cunning Little Vixen was designed by Simon Bejer with movement by Mandy Demetriou, lighting by David Howe and Darren East as the puppetry consultant. Hazel McBain was the vixen Sharp Ears, with Kieran Rayner as the Forester and a large cast which included Mria Hughes, Ailsa Mainwaring, Rebecca Silverman, Heulen Cynfal, Joanna Norman, Susanna Buckle, Ashley Mercer, William Wallace, Kenneth Read, Simon Tournier and Joanna Norman, with the South Bank Sinfonia in the pit. The opera was sung in Norman Tucker's translation. Kieran Rayner (Forester) and Simon Tournier (Harašta). Simon Bejer's designs used virtually no set, just a lit backdrop against which chorus members in black would bring on portable items. 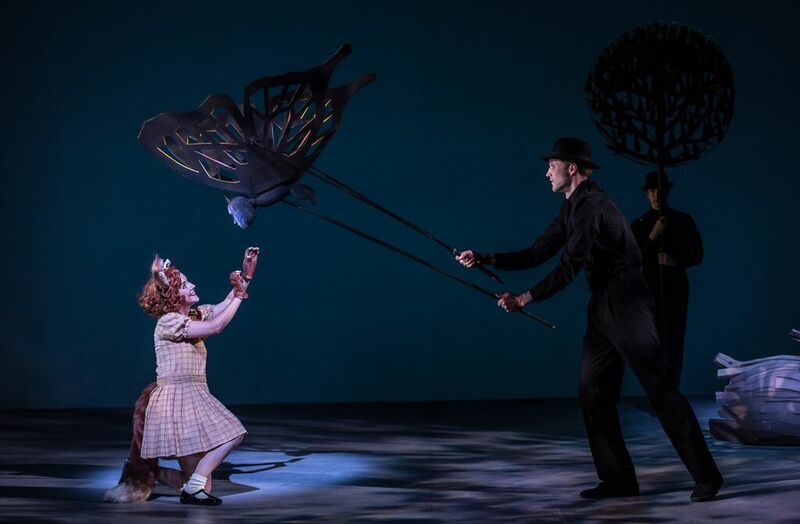 The black figures were a big feature of the entire production, holding stylised trees, manipulating the puppets which represented the animals, wearing golden fox-masks to effect the transformation scenes for the moment when Sharp Ears dreams of the moon, and when she dies. 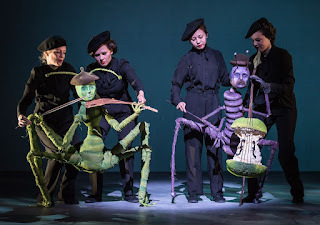 Descendants of such figures as the stylised servants in Nicholas Hytner's ENO production of Handel's Serse, the black clad figures were not completely impassive. Their headgear reflected the season and the action, and they reacted to the action around them and even had their own choreographic moments. Stuart Barker and Simon Bejer are founders of the puppet company Third Hand, whilst puppet consultant Darren East is a third generation puppeteer who was artistic associated for the Little Angel Theatre in 2013. The same team was responsible for BYO's magical production of Jonathan Dove's The Little Green Swallow, and The Cunning Little Vixen had the same magical mix of live action and puppetry. We knew we were in for a treat when the opening action included the butterfly emerging from its pupa! 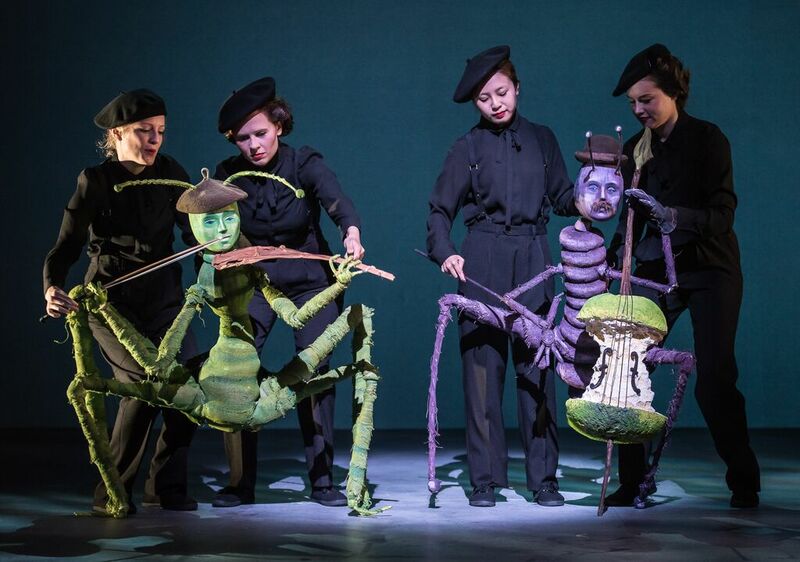 The larger animals, badger, owl and the various chorus members, were simply represented by the singer suitably dressed, whilst the smaller insects were puppets manipulated by the singer (in black) often with another puppeteer (also in black). with Victoria Songwei Li and Sîan Griffiths (Cricket). The period of the costumes was 1920's (the period it was written) and the animals were anthropomorphic so that the foxes had ears, red hair, tails but human clothes and traits, and the female foxes wore fox fur collars. Similarly for the badger. The birds (owl, hen, rooster) were imaginatively done with the singer wearing an animal costume over black, so that the bird's legs came to their middle and they 'sat' on a series of perches. 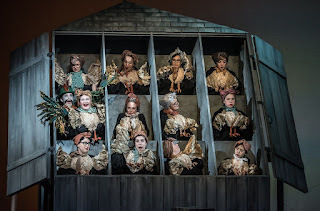 It was all very cunning, and magical and it is a testament to the strength of the performances and of Stuart Barker's production, that the puppetry did not take over, it became simply another expressive tool. Another feature of the production was that, with one exception, the humans were in black and white. the forester and his family, the parson, the schoolmaster, inn-keeper and his wife were all in black and white (including the make-up), it was clear that the forest was the real world. This was emphasised b the poacher Harasta, who was the only human in colour. At the end, when the forester died, he was transformed into colour, now at one with the forest. It was a neat idea, not overly projected so that one discovered the resonance as the opera progressed. The moment in Act 2 when Sharp Ears dreams requires a little bit of magic. Here is was brought to us by the members of the black clad chorus, here in golden fox masks, who transform the vixen into a sparkly version of herself, dance with her and lift her to the skies. It was a neat, and moving touch that they reappeared for her death and danced her into eternity. In fact Mandy Demetriou's dance made a strong contribution to the whole opera, and clearly these young singers are expected to sing Janacek, dance, as well as work puppets! Hazel McBain made a strong Sharp Ears, she clearly has great personality and projected this clearly along with a strongly focussed and finely shaped voice. Like many of the cast, her words were not always clear but I have often found that balance in the Peacock Theatre rather favours the orchestra. Also, Jancek's opera is rather ambitious in the way it expects a young lyric soprano to project over such strong orchestration. But this was a wonderfully confident assumption, full of personality and charm and Hazel McBain certainly knew how to carry the title role in the show. Kieran Rayner made an impressive and highly personable forester. His voice rode the orchestra well, even if his voice perhaps lacks the amplitude which age brings (the baritone voice is one which notoriously settles quite late). For a young singer, he brought a lively sense to the forester along with a nice gravitas and great charm. His was a highly personable incarnation. At the end, the great paen to nature perhaps lacked the ultimate in power, but instead Kieran Rayner brought a lovely sense of joy as the forester became at one with the forest. Katie Coventry made a highly believable and very personable Golden Mane, the male fox who charm Sharp Ears. Coventry and McBain made a lovely pair in the Act 2 duet. Hazel McBain (Vixen Sharp Ears), Martins Smaukstelis (Butterfly). The other humans were rather a sad bunch, but then that is what Janacek wants us to think, with Ashley Mercer's cadaverous parson, and William Wallace's sad sap of a schoolmaster with a lovely scene on the ice. The forester's family (Maria Hughes, Rebecca Silvermn and Heulen Cynfal) were similarly strongly etched and all deliberately unsympathetic. The innkeeper and his wife (Kenneth Reid and Joanna Norman) seemed rather lightly sketched in. Only Harasta the poacher, a lovely turn from Simon Tournier, seemed relaxed and enjoying life. The various animals were all well characterised, both vocally and physically. The rooster (Joanna Norman), chief hen (Susanna Buckle), and Lapak the dog (Ailsa Mainwaring) all brought a strong sense of individual personality to their roles, and in fact all the hens were wonderfully etched (and very funny). The other animals included the butterfly (Marins Smaukstelis), cricket (Victoria Songwei Li), grasshopper (Susanna Buckle), mosquito (William Wallace), frog (Iuno Connolly), Sharp Ears' mother (Lauren Joyanne Morris), badger (Ashley Mercer), owl (Maria Hughes), jay (Joanna Norman) and woodpecker (Ailsa Mainwaring). Sharp Ears and Golden Mane's children were played by members of Southend Girls' and Boys' Choirs. In the pit, the South Bank Sinfonia impressed under Lionel Friends lively and confident direction. They made strong sound with just 27 players, and all the detail in the score was not just there but projected with strength and personality and they really brought Janacek's sound world to life. Lionel Friend is BYO's new Music Director, and Stuart Barker is the Director of Training and Productions. Judging by this performance, the company is in strong hands. Finance is still tight, and they are exploring other ways of financing their operations. The opera performances this year were made possible thanks to a number of individual donations. There is also a Friends scheme, so if you would like to help then visit their web page. On 3 November 2015 there is a gala fundraising dinner at the Merchant Taylor's Hall with staged scenes from operettas performed by BYO alumni (I remember many years ago attending a BYO gala at Covent Garden in which the final was soprano Carol Vaness wearing the dress which Joan Sutherland had worn as Donizetti's Lucrezia Borgia, but singing the song I want to be a prima-donna! ).